States Lack Accurate Statistics On Widespread Heroin Use Opiate abuse has reached crisis levels, but some states aren't doing all they can to determine the depth of the problem. Finding up-to-date statistics for specific drugs is often difficult. 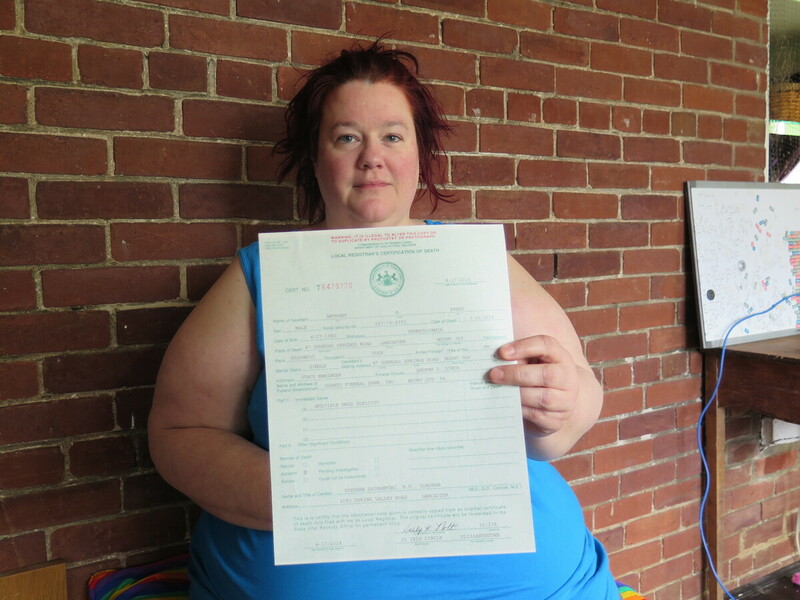 Stacy Emminger holds the death certificate for her son, Anthony, who was addicted to heroin. His death was marked as a multidrug toxicity in Pennsylvania. In Pennsylvania, it's estimated opioids like heroin killed at least 1,300 people last year. In Massachusetts, more than 1,000 have died, and in Connecticut, heroin deaths jumped more than 85 percent in two years. "If you don't know how many people are dying from it, how do you know how to combat it?" But figuring out the size and scope of the problem is harder than many people think. Pennsylvania, like many states, doesn't require reporting of specific details on drug overdoses, and whatever other information is available is at least two years old. Stacy Emminger pulls out the death certificate for her son Anthony. It have all his personal information, but is missing key details. Anthony was addicted to heroin. But that's not what's listed on the certificate. "Immediate cause of death is multiple drug toxicity, accidental," Emminger reads. "So basically an accidental overdose." Emminger lives in Mount Joy, a small, quiet town in Pennsylvania's Lancaster County. She says heroin killed Anthony. But the state's database doesn't have that level of detail. "It's critical. It's absolutely critical," says Dr. Kurt Nolte, executive vice president for the National Association of Medical Examiners. He helped write a report that recommends listing out every drug found in a person's system. "The interventions for whether it's heroin or other illicit substances are different than, for example, if they are prescription drugs," he says. "And if you can't tell the difference because everybody's classified as multi-drug toxicity, you have no idea what's killing people." Not only does Pennsylvania's database only broadly note drug overdoses, but the most recent statistics date to 2012. The Keystone State is far from unique on this. Many others lack a complete, up-to-date and accurate database. In western Pennsylvania, heroin mixed with the pain drug fentanyl killed 22 people in a matter of weeks last year. With a real-time database, paramedics might be better prepared to stop an overdose. "You might require more than one administration of naloxone, one might not do it. It's really useful for our emergency services to have that information that fentanyl's there," says Gary Tennis, acting secretary for Pennsylvania's Department of Drug and Alcohol Programs. Beyond stocking the antidote naloxone, law enforcement also knows what to target in undercover stings, and Tennis himself can use the statistics when pushing for state funding for specific treatment programs. Tennis estimates that the CDC numbers for Pennsylvania miss hundreds of opiate deaths. "They're still high, they're still incredibly high and tragically high, but I think probably more than that died," he says. In Pennsylvania, coroners can now send the state a standard form detailing all the drugs in someone's system. But the extra steps aren't required, and there's no public database set up yet. Until it launches, Pennsylvania, like so many other states, will have to rely on a patchwork of statistics to figure out exactly how deep the heroin crisis cuts. Since Stacy Emminger lost her son, she's joined grief groups online and says parents all over the country talk about how it's a crisis in their area. "It's just amazing, suddenly, how heroin has just ballooned out of control," she says. "If you don't know how many people are dying from it, how do you know how to combat it?" This story was part of a collaboration between member station WITF and PublicSource, a nonprofit journalism outlet based in Pittsburgh.